A little blurry, but oh, what a spread! Last week Regina and I had a couple of great friends over for an early dinner. Well, all dinners are early when you have an infant, but luckily our friends are obliging and understanding. Of course when I put out a spread like this of course they are obliging! Mitch supplied the wine and Stef made a excellent blueberry pie to finish the meal with. Starting from the bottom left and travelling a meandering path up the table in a vaguely clockwise direction the dishes are as follows: garlic aioli with a touch of saffron, garlicky sautéed mushrooms, paprika-dusted fried chicken wings, roasted purple cauliflower with shallots and a hit of sherry vinegar, marcona almonds, pickled peppadew peppers (say that five times fast! 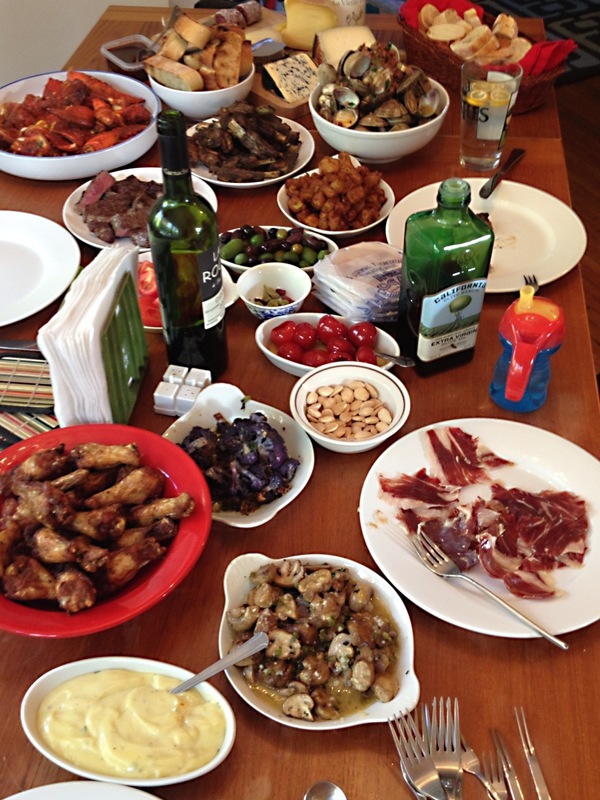 ), lightly sweetened olive oil crackers (in the wax paper), assorted olives, patatas bravas (crispy fried potatoes), grilled lamb riblets, grilled ribeye with roasted garlic, lobster with saffron sofrito, grilled bread for pan con tomate, membrillo (Spanish quince paste), assorted cheese platter including cabrales, idiazabal, some kind of hard Basque cheese that I’ve forgotten the name of, and some nice Spanish chorizo (not to be confused with the Mexican stuff), clams with garlic and white wine and diced chorizo, and finally at the bottom right a plate of hand-shaved slices of one of the world’s great cured meats — Jamon Iberico “pata negra” — a dry-cured ham made from these cute little black pigs that feast on acorns. Eating like this — with a wide assortment of small plates with complementing and contrasting flavors and textures and colors — is so enjoyable and delicious and fun and communal that I wish we could feast like this every night! I’d be 300 pounds, but I’d be happy as a clam cooked with white wine and chorizo.